It's all go at the moment. This week I've been able to really get to work on UFO, and as you can see from the image above it's starting to come together quite nicely. 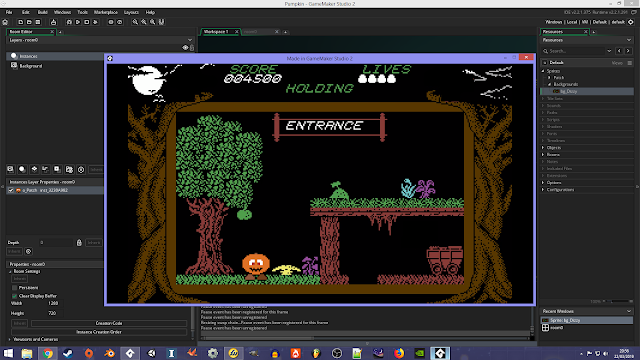 The game currently only has one looping level, but most of the gameplay elements are in place and running and I just need to add some sound effects at this stage and then crack on with fleshing out what is there into a proper game. The player clears the wave by first collecting all the sheep, which also replenish the UFO's energy, and then finishing off the remaining Earth forces. The Earth units current consist of helicopters and tanks, but later levels will see the addition of jets, missiles, blimps and gunships all being sent against the alien invaders to stop them from stealing all the livestock. Later levels may also see the inclusion of humans to abduct, but I've not made up my mind on this one yet. The other game I'm working on is the platform adventure Pumpkin Patch and the Sorcerer's Lair. As I've mostly been working on UFO this week, I've not done much with it aside from some simple animation tests of the main character (as you can see below it's coming along but still needs work), but full development will begin once UFO is closer to completion. I started working on my new game this week. The game is a platform game based on Finders Keepers and Jet Set Willy, and I might borrow some ideas from the Dizzy series. I've never created a platform game before, so this is a bit of a learning process for me. This is why I decided to look at older games to see if I can get some inspiration and use them to figure out how a few things will work. Also, animation isn't my strongest skill, so working out the walking animations for the main character is going to be a challenge. 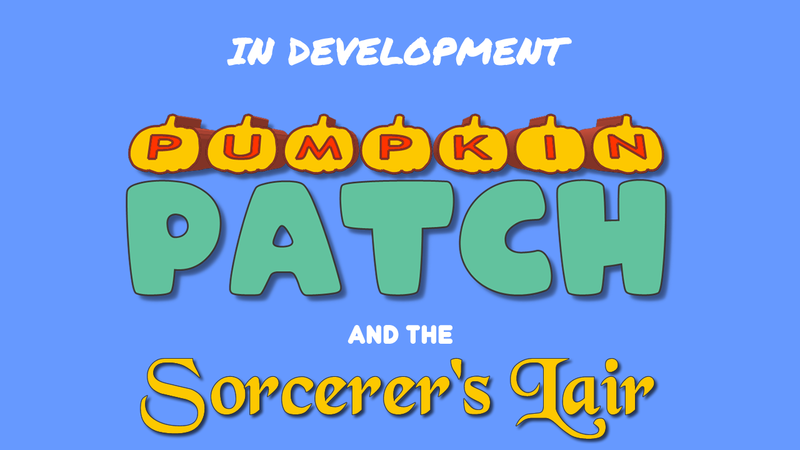 In the game you'll play the part of a sorcerers apprentice who gets himself into trouble by messing around with his masters spell book and turns himself into a pumpkin, so you have to search the castle looking for ingredients for a counter spell in order to turn yourself back. So far I'm aiming for eight to ten things to collect and you'll bring these back to a chamber where you'll cast the spell and finish the game. If I can get this to work, I might look at making a series of Pumpkin Patch games. Below is a quick mock-up that I created in GML using some assets from a Dizzy game to show how the game might look when finished. This is obviously just a test and the graphics will look a bit different from this when it's completed. So, why did I never make a platform game before? Well, the simplest answer to that is I was never able to figure out how to do it properly, so this is likely to be a long project while I work out how to get stuff working properly. I did try to make a platform game back on the C64, but I wasn't able to really make it work. So, hopefully, this one will turn out okay. If it doesn't I still have UFO to fall back on (yes, I am still working on this). I started messing around with games development in 2014, having given up programming 20 years previously. I returned to games because in 2009 my mother became unwell and I was unable to work. 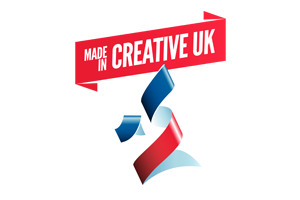 Being stuck at home, I was stuck for something to do alongside my duties as a carer and stumbled across Game Maker Studio on Steam in late 2013. Game Maker Studio... At first I sort of dismissed it as I thought it would be just another one of those "make you own games" things that promise a lot but deliver very little, a bit like the old Shoot 'Em Up Construction Kit or that one where you could make text adventures (the name of which I've forgotten). I kept looking at it, thinking "It looks interesting... Maybe it's worth a shot!" and eventually bought it when it appeared on sale for 50% off. My initial impression of GMS was that it was okay, but not really something I'd use for any long space of time. But I quickly got to working with it, finding the GML language to be very easy to pick up, and started working on a game called Blokker. I intended to release Blokker through IndieDB, but I never actually completed it. The game was going to be a Breakout clone and feature 40 levels of increasing difficulty. It was going well, but I got bored with it about three quarters of the way through development. I decided that I didn't really want to go back to making games and uninstalled Game Maker Studio. Fast forward a few months and I was thinking of making games again. Being a full-time carer is fine, but it does mean very long stretches of time where I'm in the house for days, weeks or months on end without a break, only getting out to do shopping or pay bills, and this can lead to some frustration. So I was wondering whether it'd be worth trying to start a small games studio that I can run from home in my spare time when I'm not otherwise engaged. Something to do to stop me going stir crazy. And then perhaps turn it into a proper business later on. BritBitGames (all one word with weird capitalisation) was what I came up with. I started working on Blokker again and designed a small website to go with it. However, I quickly realised that I still didn't care that much for Blokker and shifted focus to a thing called Project Prototype. Project Prototype was an idea I had where I would release demo versions of games I was working on and people could offer feedback and suggestions as to what they'd like to see added to the game before the release as a final product. The first, and only, game that came from this was UTS-187. It was released for free on Desura as a 4 level demo and was featured in their Freedom Friday promotion. It was downloaded over 1000 times and got some really good reviews from the people who played it, but the actual feedback I was looking and hoping for to drive development of the final game never came. Desura shut down due to funding issues (I think) and nothing else really came of Project Prototype. I thought that maybe the 1000's of people who downloaded UTS-187 would have led to more followers and people interested in my stuff, but it really didn't work out like that and I limped along from one aborted project after another feeling a bit frustrated with things. I foolishly thought that it'd be like the past where some small success led to an audience who were interested in your stuff and further success from there. The success of things like Super Meat Boy and other indie titles tend to give the impression that it's easy to get spotted and have a hit, but it doesn't really work that way. We get to late 2016 at this point, and I was feeling a bit pee'd off with the whole games development thing. Even though UTS-187 was a minor success in terms of downloads, I was still messing around with freebies and not really making any headway towards turning BritBitGames into a proper company. So, with Brexit on the horizon, and financial uncertainty in the air, I decided it was time to call it a day once and for all. Getting a foot on the indie games ladder was proving to be a lot harder than I'd originally thought it would be, especially since it seemed a lot easier to get people to play your games 20 years ago, and I was in a situation with being a carer where it would be very hard to actually make any money from games development because I couldn't really put in the required hours to make it work, and there are lots of stupidly complicated reasons why I couldn't really make a profit from it. Then came A Collection of Bits... It was originally going to be a blog with my opinions of games and games development. However, I'd recently started reading Retro Gamer magazine and I'd noticed that there was quite a following for old games and gaming hardware. This really clicked with me because I'd been happiest as a gamer and a programmer when I was messing around with my Atari 2600, Sinclair ZX81, Commodore 64 and Amiga. I thought it might be an idea to make games based on retro ideas with the emphasis being on the gameplay and the fun rather than on flashy visuals and what top notch celebrity we can get to play the angst-ridden antihero in our next Hollywood-like-open-world-MMO-FPS-shooter-rehashed-sequel-20XX-hype-em-up! I started looking at old Atari VCS games, and games from developers who were around at the same time as I had my C64, and seeing how they were put together to extract the best gameplay from the limited hardware, and proceeded to plan out the next game I was going to make along these lines. Even though it was going to be developed on modern hardware, this game was going to be retro! This game became Retr0ids. It's a 2d Asteroids meets Robotron shooter with a few nods to the style of Jeff Minter (including camels) designed to look like it's running on a BBC computer (sort of). It was released on itch.io on Jan 18, 2017 and was surprising popular with a small group of people. It's not going to set the world on fire, by this time I'd given up any grand ideas of becoming something big in the indie scene, but it had grabbed the attention of people who enjoyed if for what it was. It helped that I'd just finished doing some graphics for Clive Townsend's Saboteur re-release and I was able to use the ninja character in that game as a villain in my own. I was also regularly hanging out in Dino Dini's Twitch stream and he helped me out by playing the game on there in between working on Kick Off Revival, which really generated some interest. I felt that I'd re-found my niche as a developer, and this led me on to creating Hyper-Galactic Spider from Mars, which pushed the retro game idea even further with a look inspired by the old Atari 2600 video games from the 80's. Sure, I still wasn't making any money and ACOB is just a very small fish an a gigantic ocean of games developers, but I was starting to enjoy it more and I think that's what really counts. I admit, I would still like to make ACOB into a proper studio and become really established as a games developer with releases on Steam and other stores, maybe even physical releases, but my current situation as a carer makes that a very difficult prospect at the moment. It's not really the amount of time I spend caring that prevents me from making this grow, it's more the systems around being a carer and having to deal with certain people in authority that make the whole thing harder than it really should be, but maybe I'll go into detail on this at a later time. It's not that I want to become the next Notch and earn billions from my games, I'd be quite happy earning a modest income and enjoying the process of making what I enjoy. Enough to buy food, pay bills and carry on gaming, and I'd be happy. In the mean time ACOB is continuing to move forward, slowly but with purpose. I've now released three full games and two demos over on acollectionofbits.itch.io, and I'm looking to start working on new projects soon. I'm still aiming towards the retro-inspired theme, though I may start looking towards a more 16-bit inspired style soon.  I'm also intending to start up the daily development streams again, but in a more casual manner than the previous ones I did last year. I just have a few things to work through at the moment, the biggest one being my mothers ongoing battle with cancer, so things are going to be progressing slowly. However, if I keep working at this, I may one day create that proper games studio that I'm aiming for! 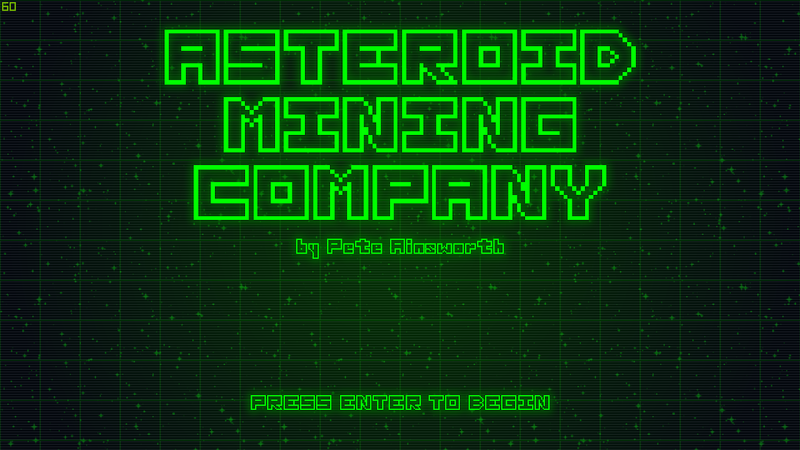 Asteroid Mining Company is a 2d arcade shooter prototype demo based on Asteroids. 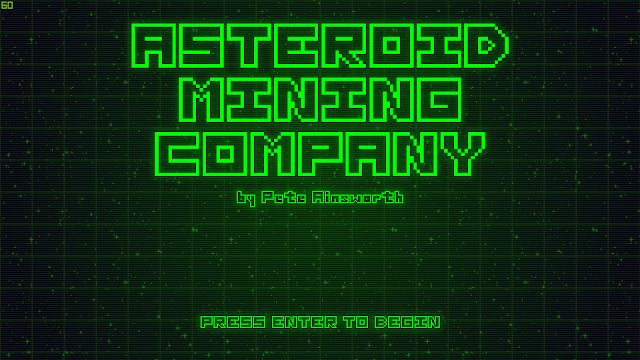 In the game you play an employee of the Asteroid Mining Company, and your job is to collect ore from asteroids that you blast with the drilling laser on your Mk IX mining drones. Unfortunately your presence in the asteroid field has attracted the attention of aliens. The aim of the game is to clear each section of the asteroid field by blasting the rocks and collecting the ore. Each zone you clear moves you further into denser areas of the asteroid field. Some of the asteroids release chemical elements that you can collect that have different effects on your ship, like adding a shield, boosting your engines and laser or replenishing your fuel. This game is a prototype demo of an idea I had for a bigger project that I've been unable to complete due to other priorities, but I may go back to it and turn it into a bigger game eventually. If you liked it and would like to see it expanded upon, drop a comment below or contact me on Twitter @PeteUplink. A quick apology for not getting the Asteroid Mining Company prototype demo out when I said I would. As you know I'm currently helping my mother recover from a breast cancer operation and with one thing and another I've not had time to get the files sorted for sharing to itch.io. I'm aiming to get it out on March 9th. © 2019 Pete Ainsworth. All Rights Reserved. Awesome Inc. theme. Powered by Blogger.